We’ve all seen messy taping jobs and tripped over poorly secured cords. And if you’ve ever been the one who had to tape down all the cabling, you know what a pain that is to do. So stop crawling around on the floor and get a GaffGun. With this unique tape applicator, you can finish a half-hour job in a couple of minutes. GaffTech began in Seattle when two gaffers joined forces to make their work easier. 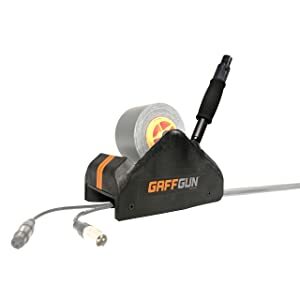 They invented the Gaff Gun to solve the problem of corralling wires and applying gaffer’s tape by hand. Let’s take a closer look at their brilliant series of tape applicators now. We’ll begin with the GaffGun that comes with a Large Cable Guide. The Large Guide can manage up to six XLR cables at a time, and it’s compatible with 3-inch-wide tape. It also works to secure air hoses, power cords, and network cables. One of the most appealing features of the GaffGun is that it comes with an extension handle. This design allows you to walk normally, pushing the applicator in front of you. There’s no bending over or getting down on your knees. The Cable Guide funnels all the individual wires into one compact form as you walk. And the applicator simultaneously covers the cables with tape. Ta-da! The job is done! Now that you’ve become a fan of this tool, you can relax knowing that it’s built with industrial grade materials. It’s going to last a long time. And it also folds down for transport. Not every gig needs six cables, so GaffTech also sells Small and Medium CableGuides, along with a FloorGuide that only lays down tape. The FloorGuide is useful for warehouse floor tape. The small cable guide holds up to two XLR wires, and the medium handles up to 4. Both guides are compatible with taping wires down with 3-inch wide rolls of tape. And you can also put a 2-inch roll on the small guide. Although you may have a favorite color or brand of gaffer tape now, you might need to adjust what you use for this applicator. In fact, this is the one reason why people sometimes call it the “gaffe tape gun.” But it’s not a mistake—it’s a feature. The GaffGun requires special rolls with a CoreLock center. CoreLock rolls click into place on the tape applicator gun. Then the applicator is able to maintain the proper amount of tension and keep the wires centered as you push it. This interlock is an essential part of what makes the GaffGun work so smoothly. Lucky for you, now there is a wide selection of floor tapes with the orange CoreLock center available all around the world. You can choose from duct, stripe, masking, double-sided, U-Tape, and lots more besides regular gaffer’s tape. We’re looking forward to using the GaffGun as often as possible because it’s an enjoyable and effective way to finish taping jobs in the blink of an eye. And GaffTech, if you’re reading this, please make a mini version for wrapping gifts, too. We hope you enjoyed our review of this indispensable gaffer tool. Check back soon to see new reviews of the best gadgets for your wish list, your gift list, and your home.